This sequel to The Adventures of Barry McKenzie is a substantial improvement on its predecessor in many ways. The humor is as raucous as in the previous entry but the script is much tighter and more skillfully plotted. It's also more ambitious, weaving in satire of spy-films, musicals, horror films and even an amusing swipe at kung-fu cinema. 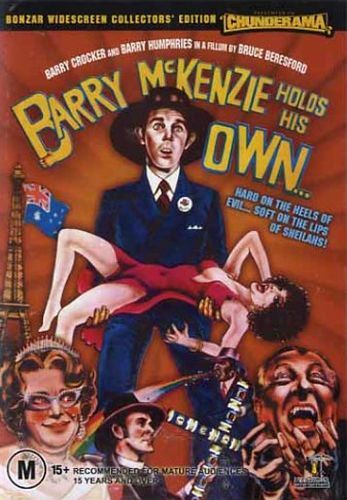 That said, there are more than just gags going on in Barry McKenzie Holds His Own: the film's underlying narrative thread is the relationship between Australians and other cultures of the world, particularly their tense relationship with the English. Bruce Beresford's direction is much more confident: he keeps the gags rolling at a breakneck clip, captures the action with a heightened degree of visual flair and successfully creates an anything-goes tone that makes the film unpredictable fun. The two stars of the first Barry McKenzie outing reprise their roles with great success: Barry Crocker continues to be an endearingly daft hero as the title character and co-writer Barry Humphries steals many a scene as the campy-granny heroine Edna Everage. However, the big surprise in terms of acting is a delightful turn from Donald Pleasance as Count Von Plasma: Pleasance digs into his horror-parody role with relish and sends up vampire clichés in a knowing, hilarious fashion. In short, Barry McKenzie Holds His Own is a wildly humorous delight from start to finish and worth a look for fans of cult comedies.